Reiki is the Japanese word for universal life force energy and is the name of a healing therapy which maximizes the benefit from this universal energy. It was founded in the 1800’s in Japan by Mikao Usui, a Buddhist who dedicated his life to the study of hands-on healing methods. It is not a religion, as it holds no creed or doctrine. It is not a belief system, therefore, no mental preparation or direction is needed to receive a treatment, only a desire to receive and accept the energy. Having a treatment does not involve massage. Since Reiki requires no specific setting or preparation, it can be utilized in all hospital environments, including outpatient clinics, emergency rooms, intensive-care units, operating rooms. It complements and enhances all types of medical treatment. It helps relieve stress, agitation and acute and chronic pain; it is helpful as an aid for sleeping; and it also can be an energizer. It promotes the release of emotions such as grief, anger or anxiety and provides comfort in palliative care. Reiki accelerates wound healing. It produces a feeling of mental clarity, calmness, well-being and spiritual connection in the recipient. Reiki aids healing in virtually every known illness and injury. Every person responds differently to treatment. The person being treated is not “healed” by the practitioner. 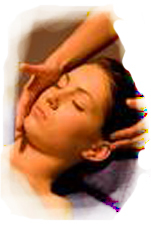 The person’s healing comes from the life force flowing through the Reiki practitioner. There are no side effects or contraindications with treatment; it is noninvasive and safe for all ages from premature babies to the elderly. It can be performed on a patient while he is lying down, sitting or standing. No adjustment in clothing needs to be made, since energy flows through any barrier, including casts. Having a treatment is really quite simple. You will lie on a comfortably padded massage table, fully clothed, for approximately 45 minutes to one hour. Modesty is respected at all times. The practitioner will place his or her hands gently on top of your clothing over key positions on your body. Many people fall asleep during the treatment because they feel so relaxed. You are a participant in your health care and are always in control. Practitioners have received both instructions and “attunements” which raise and accelerate their energy flow. The practitioner provides a treatment by the gentle act of “laying on of hands” with the intention to be of assistance. The result is that the health giving life-force energy in the recipient’s body becomes amplified and balanced.